Decades before the Iraq War revived the term "no-bid contract," the Teapot Dome scandal brought shady contracting into the limelight. In 1922, Secretary of the Interior Albert Fall leased the Navy's oil reserve fields  including one at Teapot Dome, Wyoming  to private oil companies. That April, the Wall Street Journal reported that the leases had been awarded without competitive bidding. A two-year Senate investigation uncovered no clear evidence of wrongdoing, but documents kept disappearing, and Secretary Fall kept getting richer. Finally, investigators discovered a $100,000 loan to Fall from an oil company executive. He was found guilty of bribery and became the first presidential cabinet member imprisoned for crimes committed in office. The repercussions extended beyond Fall. 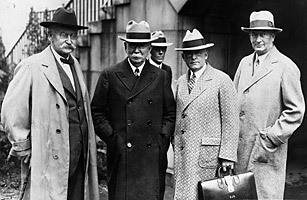 Although President Theodore Roosevelt's sons, Theodore Roosevelt, Jr., the Assistant Secretary of the Navy in charge of executing the leases, and Archibald Roosevelt, a vice-president of one of the oil companies, were both cleared of all charges, the Teapot Dome scandal haunted Ted in his campaign for governor of New York and ended his political career.